Conventional Loans are the traditional mortgage, backed by Freddie Mac or Fannie Mae, but not insured by any government entity. They traditionally require 5% down, but recent changes only require 3% down for qualified applicants. 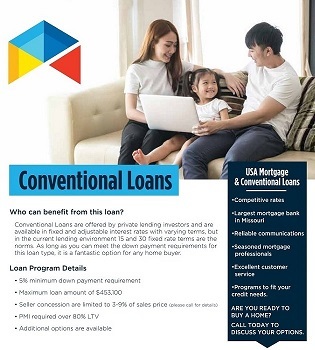 Conventional Loans are offered by private lending investors and are available in fixed and adjustable interest rates with varying terms, but in the current lending environment 15 and 30 fixed rate terms are the norms. With anything less than a 20% down payment, private mortgage insurance will be required, but USA Mortgage offers all the options available to structure this expense in the most beneficial way to you! Interest rates on conventional loans vary quite a bit depending on credit score and down payment, but conventional Mortgage loans have the potential for the most competitive rates and closing costs. Clients are looking for low or no private mortgage insurance. Clients are looking to buy vacation homes or investment properties. Parents who want to buy properties for their children and friends to live in while attending college. Clients who have a substantial down-payment by avoiding PMI costs. Conventional home loans have a lot of advantages over other loan types. There are no up-front funding fees, gift money is allowed, and there are no restrictions on the location of the property. As long as you can meet the down payment requirements for this loan type, it is a fantastic option for any home buyer. From start to finish everything happens in-house, processing, underwriting, and funding. Freddie Mac and Fannie Mae direct lender. Offers low or no originations fees as a lender and no junk fees added. Largest privately owned mortgage bank in the State of Missouri.